Dental disease is the most frequently diagnosed health problem in cats. Seventy to ninety percent of cats have some level of dental disease. If left untreated, it can lead to health problems for your cat, ranging from bad breath, dental pain and loose teeth to systemic illnesses that can be life-threatening. Normal teeth in cats should be white or just a little yellow. Gums should be light pink and smooth (except in breeds with pigmented gums). 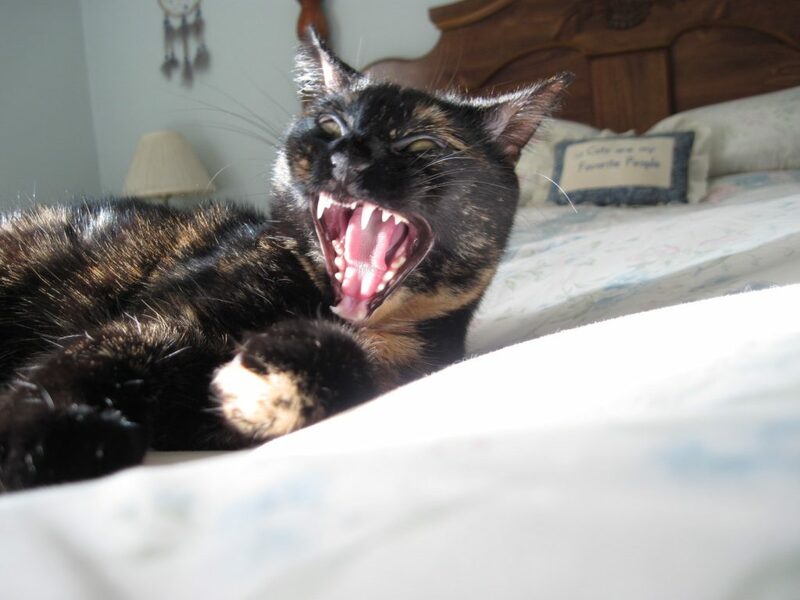 Dental disease begins with a build up of plaque and tartar in your cat’s mouth. Without proper preventive and therapeutic care, plaque and tartar buildup leads to periodontal disease, which manifests in red and/or swollen and tender gums, bad breath, and bleeding. When the gums are swollen, they can be painful – a good rule of thumb is that if it looks like it might be painful, it probably is. As bacteria from the inflammation and infection associated with periodontal disease is released into the bloodstream, this can lead to damage to other organs such as the heart, kidney and liver, resulting in serious health problems. Dental disease in cats can also be an indicator of immune system disorders. One common dental problem that generally shows up around the age of four or five in 25-70% of cats are feline odontoclastic resorptive lesions, also known as neck lesions, cavities or root absorptions. Patients affected with FORLs may drool, bleed, or have difficulty eating. A portion of affected cats do not show clinical signs. Since cats are such masters at hiding pain, they frequently don’t show any symptoms until the situation is literally life-threatening. They will eat even when their level of chronic mouth pain would send a person to the emergency room. They almost never paw at their face, even with loose or abscessed teeth. They can get pretty smelly breath from eating cat food, so it’s tough to tell by smelling the breath whether your cat has dental disease or has just eaten. But even though they don’t show us much in the way of outward symptoms, chronic dental/periodontal disease can cause severe and often irreversible damage to internal organs. What can you do to prevent dental disease in your cat? Regular veterinary exams, at least once a year, and twice a year for cats seven and older or for cats with a known history of dental problems, are a must. During the exam, the veterinarian will assess your cat’s teeth to determine the degree of dental disease. Since our cats won’t just sit still and open their mouths to have their teeth cleaned like humans, dental procedures for pets require general anesthesia, something that makes many pet owners nervous. While there are always risks with anesthesia, they can be minimized with a thorough pre-anesthetic check up, including bloodwork to assess kidney and liver function and rule out other underlying health issues. This will allow your veterinarian to customize the anesthesia to your pet’s health status and potential special needs. Keep in mind that leaving dental disease untreated may present a far greater risk than anesthesia. Contrary to what you may have heard, dry food does not clean your pet’s teeth. Most cats don’t chew their kibble long enough for any of the scraping action that is the theory behind this myth to kick in. What little they do chew shatters into small pieces. Some pet food manufacturers offer “dental diets” that are made up of larger than normal sized kibble to encourage chewing, but in my years at veterinary practices, I’ve seen many cats swallow even those larger size pieces whole. Additionally, dry food leaves a carbohydrate residue in the cat’s mouth that actually encourages growth of tartar and plaque. Cats do best on a grain-free canned or raw diet. In fact, the moisture in these diets may actually help wash away some of the plaque, rather than allowing it to adhere to teeth. Additionally, the enzymes present in raw food may help prevent plaque. You can also give your cat raw chicken necks to chew on. Never give cooked bones to your cat, they are brittle and can splinter and lodge in your cat’s intestines. Dental treats such as Greenies are simply dry food in disguise, and won’t do anything to prevent plaque. The chlorophyll added to some of these treats may help your cat’s breath smell better, but this may mask more serious health problems. There are a number of dental sprays and water additives on the market that claim that they can prevent and even eliminate plaque. Be very careful when evaluating these products. Some may help, but others, at best, do nothing except provide cosmetic benefits by making the teeth appear whiter and masking more serious disease, and at worst, may actually harm your cat. Any product taken internally can have harmful side effects, even if it’s “natural” or “herbal.” Be especially wary of “proprietary formulas” and/or products that don’t disclose their ingredients. I brush Allegra and Ruby’s teeth every night. Despite counseling clients in the veterinary clinics I worked at on how to do this, I confess that I never did it with my own cats until I got these two. I used a four-week program to get them used to having their teeth brushed, and they both took to it surprisingly well. So don’t rule out brushing your cat’s teeth with an immediate “no way” response. Give it a try. It may just be the best thing you do for your cat’s health. Your link to the 4 week program to get your cats into brushing doesn’t seem to work anymore. I’d love to see a step by step program. I can’t imagine how I could get these three mooks to sit still for tooth brushing. Thank you for letting me know about the outdated link, Marion. Here’s the correct link: https://consciouscat.net/2018/02/12/brushing-cats-teeth-training-program/ Let me know how it works for your cats! 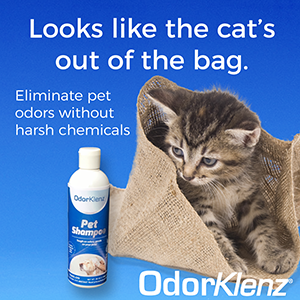 My cat has a few dental problems and i have been given the Oxyfresh Solution for my cat. I sprayed it into her mouth two times daily as it sais on the bottle because my cat is an outdoor cat and she hardly drinks the water we give her because she likes to drink the water where our water lilies are planted in for whatever reason. So i can’t mix that into that water or any water really. I realised today that she likes to like the solution from the bottle (because i spilled some accidentally) and if that means that she will take it on her own and consider it a treat i could just give it to her on a spoon. Now the problem is, am i allowed to do that? And if yes how many mg am i allowed to give her? Because it said 5 mg for a quart of water. I hope you could help me with this silly problem, but it would be way easier for my cat considering i have to give her the whole bottle. Which brand of wet cat food do you recommend for a 6 year old FIV amazing cat with gingivitis? I am open to other suggestions for oral care as you see fit. Thank you for your recommendation. I have a old cat (about 15) and a young cat (around 3). I adopted them both as adults. I started them both on tooth brushing and daily dental spray a few months ago. Perhaps they are the exception to the rule, but I literally started them both on the full toothbrushing regimen cold turkey with no transition period whatsoever. I just up and decided that they were going to get their teeth brushed every day and we started immediately. I brush their teeth every night and even my 9 year old daughter is starting to learn cat toothbrushing technique. It’s really simple. I think that cats are more adaptable than we give them credit for. Good for you, Ruth! I completely agree that almost every cat can be taught to accept having her teeth brushed. And I love that you’re teaching our daughter, too! I love my cat and I’m very concerned about her health, but I never think about her dental health. She keeps herself really clean, so I kind of assume that she takes good care of her own teeth. I should check out her teeth to make sure that they’re healthy. I should also start brushing her teeth. What should I do to help get her used to brushing her teeth. She’s one years old, so she’s not a kitten anymore. She’s a very chill cat, except when you try to put your fingers anywhere near her mouth. She isn’t a biter, but she sure is a fighter. Any advice would be appreciated. Thank you so much, Ingrid. This information should help to get my cat used to having her teeth brushed. She’s very set in her ways, so we’ll see how this goes. Wish me luck! My girls are raw-fed, but they won’t eat bones, either, Cindy. Or rather, in the interest of full disclosure, I don’t give them bones. The first time I tried it, they dragged them all over the house, and I just didn’t have the stomach to try again. Thanks for the recommendation of Oxyfresh, Ingrid. With my cats, I end up having to get dental cleanings for at least 2 of them (albeit, a different 2) every year. I have had some limited success for a couple of them with wrapping my forefinger with gauze and just wiping the outside surfaces of their teeth. Our vet told us that this is just as good as brushing and can go a bit quicker. It’s also helpful to remember that you don’t need to use toothpaste if you do try to wipe/brush your cat’s teeth. Just loosening the plaque is what’s important. They just end up swallowing most of any paste you would get in their mouths anyway. Can’t wait to see if the Oxyfresh makes a difference over the next year. Every little bit helps, Danielle. That’s great that you can at least wipe the teeth of a couple of your cats. I hope the Oxyfresh works for you. Dry food (and I include treats in this definition) turns into a sticky paste when mixed with saliva in the mouth, and this paste adheres to teeth and gums much more than canned or raw food. The processed carbohydrates in dry food that form this dry paste support bacterial growth in the mouth. Additionally, dry foods are coated with animal digest to make them more palatable to pets, and these substances tend to be more acidic, leading to breaking down the enamel of the teeth. The idea that these dry foods or treats prevent tartar and plaque make as much sense to me as a human dentist telling a patient that they should eat dry cereal or corn chips to clean their teeth. As far as the enzymes in raw food, it is my understanding that they can help maintain oral health and prevent plaque and tartar build up. It has been observed that cats raised on a raw diet don’t need dental cleanings as frequently as cats raised on other diets (although to some extent, this is also determined by genetics). This could be because of a generally healthier immune system as a result of these diets, or because the more natural diets preserve a healthier oral environment. I am not sure about greenies for cats, but I know greenies for Dogs have good evidence for working. Greenies® recently became the first and only treat to receive the Veterinary Oral Health Council ® (VOHC ®) seal for both plaque and tartar. VOHC recognizes products that meet pre-set standards of plaque and calculus (tartar) retardation in dogs and cats. I appreciate your comment, Michael, but I remain skeptical about the efficacy of Greenies or other dental treats and diets. The list of products approved by the VOHC includes, in addition to Greenies, a long list of diets with what I consider inferior ingredients. These products contain anything from by-products to grains such as corn and soy to preservatives. I can’t, in good conscience, recommend these products to my readers. This is a timely subject of Odin. 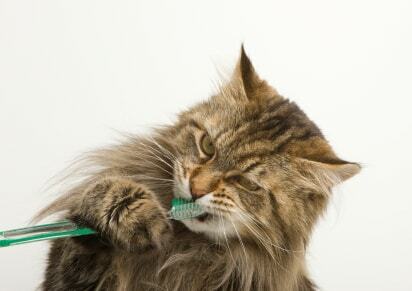 Teeth brushing has never worked for any of my cats but need to address it sooner than later. I can’t wait to hear whether brushing Odin’s teeth will work out! Our cats both like those Greenies, sorry to hear they don’t really clean the teeth. Manny had an absessed tooth and I was so nervous about them pulling it out but he managed just fine. I’m off to look into that Oxyfresh Solution now. My cats won’t stand for me to brush their teeth. I think it is very challenging to get cats used to having their teeth brushed. I don’t personally know any cats that allow their owners to do it! I established a daily routine with my cats that includes combing (especially during flea season), ear inspection (and gentle cleaning when needed), nail clipping, and yes, teeth brushing. All three tolerate this well. My trick is to stay relaxed and talk softly when I clip, flea comb, and stick gauze or baby toothbrush in the mouth. The cleaning takes just a couple seconds – a quick wipe on each side – I don’t push it or fight them. I quickly pull the lip away and swipe, swipe, swipe. My boy joined the family at age 7, so this is possible for an older cat. If you clip your cats nails, you can add other things as part of the routine. Give them a little treat when they’re done! Jeanne, that’s great that you can clean all three of your cats’ teeth. It is the best way to prevent dental problems down the road.